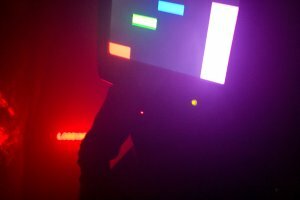 robotcowboy and osc hit the Danish electronic music festival in Sweden: Norberg Festival 07. Thanks to Mattias and Daniel for letting us play at their Camp 303 (un)offical stage and for lots and lots of fog machine. There were some initial problems with a dead battery and audio connections, but everything ended up working in the end! ArpeggiateNow made its first appearance and rocked the bumpitybump! Check out this 99.se Norberg 07 forum for some reviews of our Moose Mine action. (in Swedish) Thanks to all who enjoyed and put out the e-love.